German site 3DCenter.org has obtained interesting information concerning the upcoming GF104 chip from Nvidia. The graphics processing unit (GPU) is a derivative of the GF100/Fermi architecture and is aimed at the mainstream market. The part could power up to three graphics card models, aiming at countering HD5770 and HD5830 products from AMD. Proposed naming scheme includes GTS 450, GTS 440 and GTS 430. The new silicon would feature a maximum of 256 shader cores which is exactly half of what is found on the GF100 die found in GTX480 and GTX470 products. The GPU memory is fed through a 256-bit wide memory bus connected to GDDR5 chips. The new GF104 is to operate at maximum frequencies not far from the already released 400-series of Nvidia cards, with the core set at 725Mhz, shader cores functioning at 1500Mhz and memory cruising at 1800Mhz. Power consumption is not yet known but as the new graphics chip is expected to be comparable in size to higher-end AMD products and will be built on the same 40nm process, it could consume upwards of 150 watts. According to website Nordic Hardware, cards based on the GF104 will cover the mainstream market with prices ranging from 150 to 250 euros, depending on the model. American consumers should expect those prices to be translated into US$, looking at the $150-250 range. Graphics cards based on GF104 are expected to hit the shelves in late Q2 or early Q3 2010. Other Fermi derivatives, GF106 and GF108, will take care of the budget and entry-level markets later in the year. Heh, who is expecting them come summer? Actually to be fair, these will have a much smaller die and therefor much larger yield. I'm going to laugh if their mid range cards draw as much juice per performance as the big ones though. I hope they can get that fixed quickly. Otherwise, say hello to a card competing with a 5770 and drawing like a 5850. 256 cores is still more than the 240 that the GTX280/285 has, so these should be very capable cards. The 256-bit bus coupled w/ GDDR5 should give similar bandwidth to the 512-bit bus and GDDR3 that the GTX280/285 has as well. All in all I'm thinking the GTS450 will outperform the GTX280/285, and if they come in at the $250 price range as indicated in the article then they'll be priced similarly as well. I'm not sure how much the power consumption will go down, but I'm sure it will be significant. I'm just guessing here, but let's say the GF100 core consumes 200W out of the 250W that the total card consumes. If cutting GF100 in half reduces that to 100W on the core that would be great, and if further core power efficiencies are possible due to the smaller die size then that can only make things better. If the main enemy of the GF100 is it's size then these chips should be significantly more efficient. These could be great upgrades for people still on 8800GT/GTS, 9800GT/GTX, or GTS250 or below that want to stay with nVidia and don't want to fork out $300+. The actual testing i read showed the 480 to be closer to 300 then 250, and way over 300 with a furmark load, i'm not sure i'd go with the TDP in this case. Well if the GTX480 is pulling 300W in the test done by Hardware Canucks then that only leaves 92W for the rest of the system. That doesn't seem right. And if that's true then the 5970 and GTX295 have to be pulling about 325W, and I'm not sure I believe that either. I wouldn't believe any Furmark result comparisons either since ATI has deliberately put code in their drivers to not let their cards run at full gallop when the Furmark executable is launched. Obviously there are ways around that, but I'm not sure that's accounted for in reviews. And I don't blame ATI for doing it either; Furmark puts out an unrealistic load, and has been known to kill cards. I don't recommend running it for extended periods of time, and I only use it in windowed mode. It's not very good at showing artifacts anyway. It's more of just a burn test IMO. Yeah, it's hard to know what is accurate. If the GTX480 is drawing 300W in the Anandtech test then the 4870X2 has to be drawing 338W, and that doesn't seem right either. Canucks has the 5970 and GTX295 drawing more wattage than the GTX480, while Anandtech shows the opposite. Another thing I like to look at is the difference between a single GTX480 and 2 in SLI. Because the difference between those 2 configs is exactly 1 GTX480. Anandtech is showing a delta of 247W, and HardOCP shows 115W (seems like we should throw their results out). Yeah, it's hard to know what is accurate. If the GTX480 is drawing 300W in the Anadtech test then the 4870X2 has to be drawing 338W, and that doesn't seem right either. 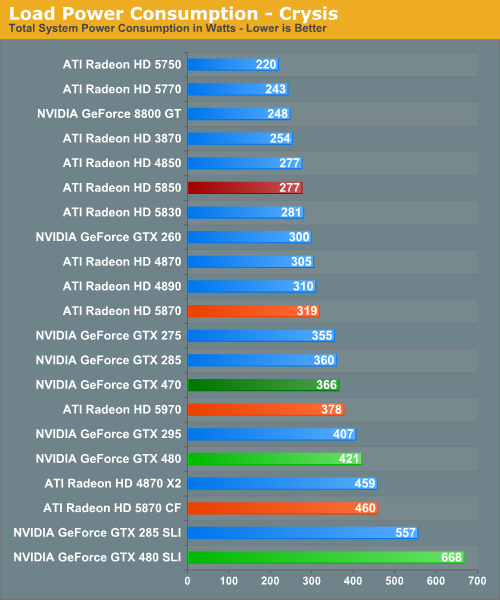 Canucks has the 5970 and GTX295 drawing more wattage than the GTX480, while Anadtech shows the opposite. Another thing I like to look at is the difference between a single GTX480 and 2 in SLI. Because the difference between those 2 configs is exactly 1 GTX480. Anadtech is showing a delta of 247W, and HardOCP shows 115W (seems like we should throw their results out). I agree the numbers seem off but from the reviews I've read (Canucks is the first I've seen with significantly different figures) the GTX 480 is consistently pulling more wattage than the 5970. I just have trouble believing that a lot of the respected review sites out there could have got the figures completely wrong. Interesting stuff, I had a look at Legion Hardware's figures as well and these actually seem pretty spot on from the info that is available. This would mean the GTX 480 is a 298 watt part. As they are running furmark as well, the 4870X2 could be using more than 300 watts as it unrealistically loads the 4000 series cards, so ATI would have never seen that type of load under testing. Of course one way to test this would be to find a card that we know uses about 250 watts, (like a GTX 285?) and then run it on the lowest rated PSU possible then see if the GTX480 can run on it as well.